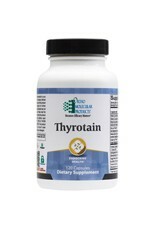 Thyroid hormones are made from amino acid L-tyrosine and iodine. 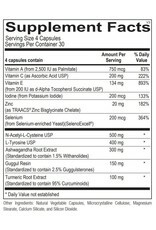 Iodine is an essential trace mineral and is necessary for the synthesis of thyroid hormones, as it is one of the most important components of the hormones T4 and T3. The thyroid gland absorbs iodine from the blood and incorporates it into thyroid hormones. 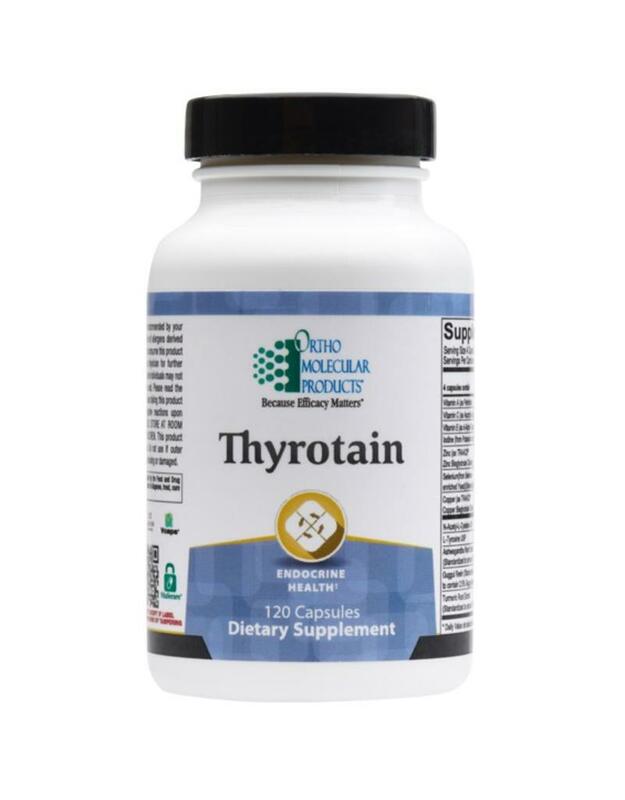 In addition to supporting thyroid hormone production, research shows iodine acts as an antioxidant, supporting a healthy thyroid gland and protecting a variety of tissues, including mammary tissue, the eyes and gastrointestinal lining. Normal thyroid status is dependent on adequate levels of many trace minerals for the synthesis and metabolism of thyroid hormones. The minerals zinc and selenium are required cofactors for the enzymes that convert T4 to T3. Selenium deficiency has been shown to contribute to decreased T4 to T3 conversion. Supplementation of selenium can also help decrease thyroperoxidase (TPO) antibodies in thyroid autoimmunity. Supplementation with zinc has been shown to restore T3 levels in patients with normal T4 and low T3, demonstrating its role in the conversion process. 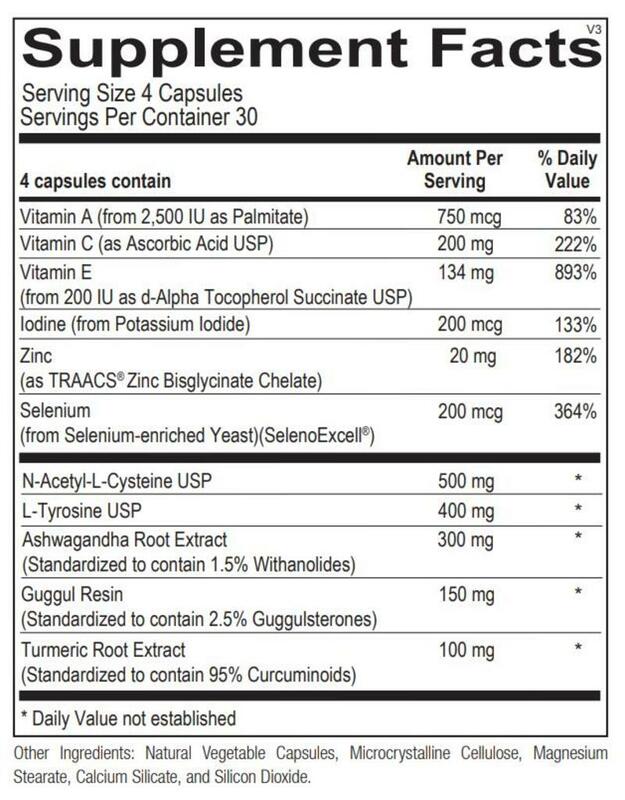 Vitamin A and vitamin E are also necessary for normal thyroid hormone manufacturing. Increased free radical activity can compromise healthy T4 to T3 conversion. N-acetyl cysteine (NAC), a precursor to the body’s master antioxidant glutathione, boosts thyroid health by accelerating antioxidant activity in the thyroid gland. Turmeric (Curcuma longa), along with the antioxidants vitamin C and E, has been shown to promote a healthy thyroid gland due to direct antioxidant activity. Ashwagandha (Withania somnifera) has been used in Aryuvedic and indigenous medical systems for over 3,000 years and has been examined in research studies for its stress-lowering effects. Ashwagandha has been found to exhibit GABA agonist activity, which accounts for its ability to relax the nervous system. Ashwagandha may also stimulate thyroid activity indirectly, via its effects on cellular antioxidant systems, specifically by increasing the antioxidant enzymes superoxide dismutase and catalase and reducing lipid peroxidation. The gum resin of the guggul plant has been used in Ayurvedic medicine in India for nearly 3,000 years. Guggulipid (Commiphora mukul) has been shown to support thyroid function, primarily by decreasing lipid peroxidation in the liver, the principal site of T3 generation. Guggul extract has also been shown to have thyroid-stimulating action by increasing iodine uptake by the thyroid gland and increasing the activities of thyroid peroxidase and protease.